Enslaved Inspired by Journey to the West and ... Moonlighting? The head of Ninja Theory said that not only is Enslaved loosely based on the Chinese novel Journey to the West but also the American 80s sitcom, Moonlighting. 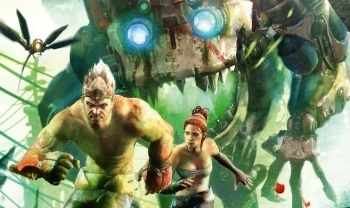 Enslaved stars Andy Serkis of LOTR-fame as a agile prisoner named Monkey. The female gadgeteer, Trip, enslaves Monkey and forces him to help her escape a post-apocalyptic New York City that is vastly overgrown with jungle foliage and robotic monstrosities. Chief of design at Ninja Theory, Tameem Antoniades, said that in addition to the widely reported similarities in story to Journey to the West, he modeled Monkey and Trip's relationship on the bickering of Cybill Shepherd and Bruce Willis in the 80s comedy series, Moonlighting. "One of my earliest games ... was called Out of this World in the States," Antoniades told Destructoid. "You form this emotional bond with this weird alien that's kind of helping you, and you're helping him, and you can't speak the same language." Antoniades said that even though other games have had that kind of a partner character, such as Yorda in Ico, no game had gone far enough with that kind of relationship. "Nobody actually tried to do it like dramatically, like real up close and personal, like you would a TV drama." "Actually, this is showing my age ... Moonlighting with Cybill Shepherd, I actually used that as a bit of an influence as well." As someone who grew up in the 80s, I have a certain fondness for Moonlighting and how it portrayed a relationship between a woman in power over a man. Willis and Shepherd were constantly bickering, but there was always the hint of sexual attraction there.